Will be easily and eagerly savoured. And the carnivorous taste for a thrill. 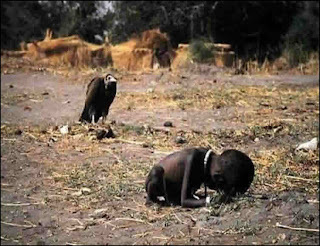 This is the Pulitzer Prize winning photo taken by Kevin Carter in 1994 during the Sudan famine. The picture depicts a famine stricken child being stalked by a hungry vulture. The child is crawling toward a United Nations food camp, located a kilometer away.